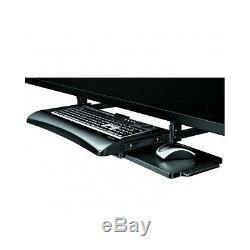 Under Desk Table Keyboard Adjustable Drawer w/Mouse Tray Computer Tablet Office NEW. Only 5 In Stock Order Today! Brand New & Factory Sealed. Converts a desk to an ergonomic workstation! Height adjustable unit moves keyboard and mouse off the desktop. Keyboard tray features three height adjustments. Easy to install and adjust. 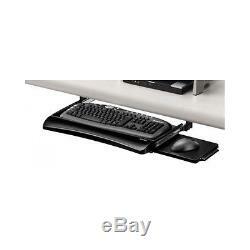 Mouse tray mounts to right or left side of keyboard tray or stows underneath when not in use. Converts a conventional desk to an ergonomic workstation! Height adjustable unit moves keyboard and mouse off the desktop to save workspace. Dimensions: 11.6 x 22 x 2.3. The height adjustable Fellowes Office Suites Underdesk Keyboard Drawer converts a conventional desk to an ergonomic workstation! Moves keyboard and mouse off the desktop to save workspace. Unit is easy to install and offers three different height adjustments to suit preferred work position. Mouse tray mounts on right or left side of keyboard tray or stows underneath keyboard tray when not in use. The depth of the unit itself from tip of the keyboard to the end of the glide track (front to back) is 16. The tip of the keyboard drawer is designed to protrude from the desk so the part underneath the desk (front to back) is 14-1/4. Reduce desktop clutter with the Fellowes Office Suites Underdesk Keyboard Drawer. Constructed from 100 percent recycled materials, this sturdy, impact-resistant drawer lets you move your keyboard and mouse off your desk to give you plenty of room to work. Easy to install, the drawer can be adjusted to three different heights and fits standard keyboards. Features 3 height adjustments to fit your preferred work position. Adjustable Keyboard Drawer with Glide Track. The Office Suites Underdesk Keyboard Drawer lets you easily place your keyboard in your ideal position with your choice of three heights (2-1/2, 2-1/8, or 1-3/4 inches below track). A keyboard stopper holds the keyboard securely in place while you work, while ball-bearing glide tracks ensure the drawer slides smoothly back and forth. Stowaway Mouse Platform Mounts on Either Side. The keyboard drawer includes a separate mouse platform that lets you mount your mouse on the left or right side of your keyboard--wherever it's most convenient for you. In addition, the mouse platform stows underneath the keyboard tray to save space when not in use. The keyboard drawer's sturdy, impact-resistant tray fits standard keyboards and is constructed from 100 percent recycled materials. What's in the Box. 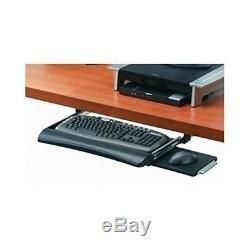 Fellowes Office Suites Underdesk Keyboard Drawer with mouse platform, glide tracks, hardware, and easy installation guide. Office Suites Underdesk Keyboard Drawer. Keyboard drawer with adjustable height stores keyboard and mouse under desk. Ball-bearing glide tracks ensure smooth operation of drawer. Mouse platform mounts left or right and stows underneath keyboard. Made from 100 percent recycled materials. We thank you in advance and appreciate your business!! Please check out my other items. Thank you and have a great day! The item "Under Desk Table Keyboard Adjustable Drawer with Mouse Tray Computer Tablet Office" is in sale since Wednesday, April 20, 2016. This item is in the category "Computers/Tablets & Networking\Laptop & Desktop Accessories\Other Laptop & Desktop Accs". The seller is "rrs_25" and is located in Spring Valley, California.